The Grand Parkway Transportation Corporation (GPTC) is a public, nonprofit corporation created by the Texas Transportation Commission to act on behalf of the Commission to lead the effort to finance, build and operate certain segments of the Grand Parkway (SH 99). The Grand Parkway is a 184-mile highway, composed of 11 segments traversing seven counties. The Grand Parkway is intended to improve mobility, reduce congestion and accommodate demographic and economic growth in the greater Houston area. Notice: To view financial reports, please visit the Financial Disclosure section of GPTC’s homepage on the Electronic Municipal Market Access System (EMMA). Sept. 28, 2017: Governor Abbott has declared a state of disaster in the Houston region due to Hurricane Harvey and the resulting flooding. To facilitate evacuation and rescue efforts, tolls were suspended on the Grand Parkway System Sunday, Aug. 27, 2017. Tolling resumed Thursday, Sept. 14, 2017, for all tolling locations except for the southbound entrance ramp and northbound exit ramp at Clay Road, which remained free until Sept. 26, 2017, when tolling resumed. Inspections of the Grand Parkway System regarding damage from Hurricane Harvey indicate that no major damage has been identified. The extent of minor damage is expected to be less than $500,000 to repair. April 5, 2016: All five initial segments of the Grand Parkway System of the Corporation are open to traffic. Segments D and E in Harris County opened in December 2013 and began tolling traffic in February 2014. 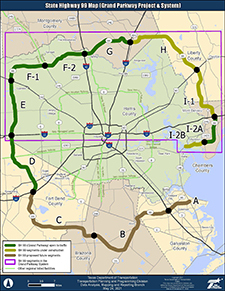 Segments F-1 and F-2 in Harris County opened and began tolling traffic in February 2016. Segment G in Montgomery County opened at the end of March 2016 and began tolling traffic on April 4, 2016. Learn more. For information on road closures in the Houston region and surrounding the Grand Parkway, visit DriveTexas™.